The year is 1859 and it’s right in the heart of the Victorian era. President James Buchanan is in the middle of his only term as Commander in Chief and Oregon just became the 33rd state in the union. America’s Civil War is still two years off. In Philadelphia the population is still around half a million and the city is receiving a steady supply of German and Irish immigrants. Only recently did the city’s suburbs start to develop into a modern form. Fast forward to now. Germantown, the neighborhood in Philadelphia, has changed a lot in 151 years, with its famous German architecture of old intermingled with buildings of the modern eras. On any given block you can see several classic German houses in various states of upkeep right next to a home built in the last several years. Among all of that is the Ebenezer Maxwell Mansion, which as anyone will learn from spending five minutes near the building is “the only authentically restored Victorian house museum and garden in Philadelphia.” Ebenezer Maxwell, a cloth merchant and a member of the newly emerging middle class built his eponymous mansion in 1859. He commuted into the city by rail and commuted back to the suburbs in the evening. His generation was one of the first to do so. The Maxwell Mansion does stand out on the 200 block of West Tulpehocken Street. Its stone facade stands boldly in stark contrast to the modern family homes that surround it. The style of architecture itself conjures up images of haunted houses in modern children’s stories, with the tall Victorian roof, the many windows that are scattered across the buildings exterior, and the dense shrubbery on the property. However, once one arrives at the front door all of those notions are quickly dispelled upon meeting the mansion’s executive director and lone employee Diane Richardson. 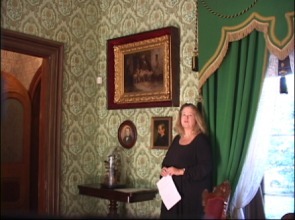 She was first associated with the mansion when she came to do research on historic window treatments. Then she was on the board briefly until the former executive director resigned. At that point she was hired as the interim part time director and and later became the new executive director. Richardson’s enthusiasm for the mansion is easy to pick up once one meets her. This is even more apparent when she starts to tell you about the history of the structure. Again, it was built by Ebenezer Maxwell in 1859, but it was sold by him three years later. “He built the mansion in 1859 for $10,000 and sold it in 1862 for $13,000, so it was almost like an investment property for him,” Richardson immediately says when asked about the history of the building itself. In 1862 Maxwell sold the house to the Hunters. “Unfortunately, four years after the Hunters moved in, Mr. Hunter was killed in an unfortunate accident in New York City. His wife then remarried a guy named Stevenson,” Richardson says. The Stevensons, who were far wealthier than either the Maxwells or the Hunters, had several properties in addition to the mansion, including homes in New York City and Newport. The Maxwells and the Hunter-Stevensons were the only two families to live in the mansion, with the last descendent of the latter passing away in 1957. The house was then willed to the American Red Cross, which sold it to a gas station that tried to demolish it. When zoning regulations stopped that from happening, the house was sold to a nursing home, which also wanted to demolish it. “There was a meeting of the board of directors of the nursing home, and at the meeting the initiative to not tear it down won by one vote,” Richardson adds with a sense of pride in her voice. After the house was saved from “the wrecker ball,” as Richardson puts it, the structure went into disrepair before it was designated as a museum in the 1970s. Then, to return the mansion to its original state, researchers came in to put paint scrapings under the microscope in order to get the interiors looking as authentic as possible. Now that the museum is open Richardson is always looking for new volunteers. Programming is what the mansion is using to make a name for itself. The museum had its Fourth Annual Murder Mystery on two weekends around Halloween. For that, the museum had a sold out crowd, which is well over 350 people, Richardson said. 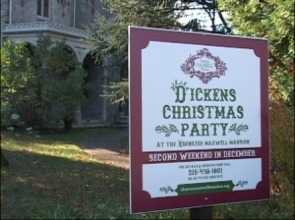 In December the museum is also advertising a Dickens Christmas Party. Then, the house will be decorated in a Christmas style and there will be readings of Charles Dickens and Louisa May Alcott. Richardson considers the Ebenezer Maxwell Mansion as the cornerstone of the Tulpehocken Station Historic District and a rather important part of historic Germantown as a whole. As she tells it, the neighbors are always willing to help with this historic site, which allows it to have a huge impact on the community as a whole. The Ebenezer Maxwell Mansion is more than just another historic site in a city full of them. It’s an integral part of a vibrant community and an important part of historic Philadelphia. This article was written and reported by Chris Banks forPhiladelphia Neighborhoods, a publication of Temple University's Multimedia Urban Reporting Lab, and originally published on November 11, 2010. 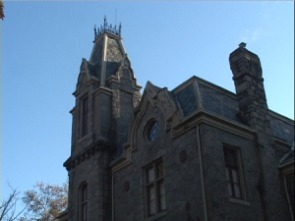 The Ebenezer Maxwell Mansion, The Historical Society of Pennsylvania.